Backed by immense glass tanks filled with an astounding variety of marine life, the Aquarium Of The Pacific in Long Beach makes for a dramatically unique wedding venue. Whether you are planning an intimate celebration or a lavish wedding day with a few hundred guests, this blue-tinged, watery wonderland makes a strong statement. Once closed to the public for the day, this sprawling aquarium is all yours, with multiple spaces that are beautifully transformed into romantic, dimly-lit wedding venues. You can walk down the aisle towards the three-story Blue Cavern tank, which provides a breathtaking backdrop to your ceremony images, with exhibits that are in a constant state of natural flow. As your guests are enjoying cocktail hour in the Shark Lagoon exhibit, take the opportunity to capture dramatic and creative couple portraits in the plethora of spaces available at the Aquarium Of The Pacific. Spontaneity is key here, with seals swimming into your images and jellyfish bobbing lucidly in the backdrop. 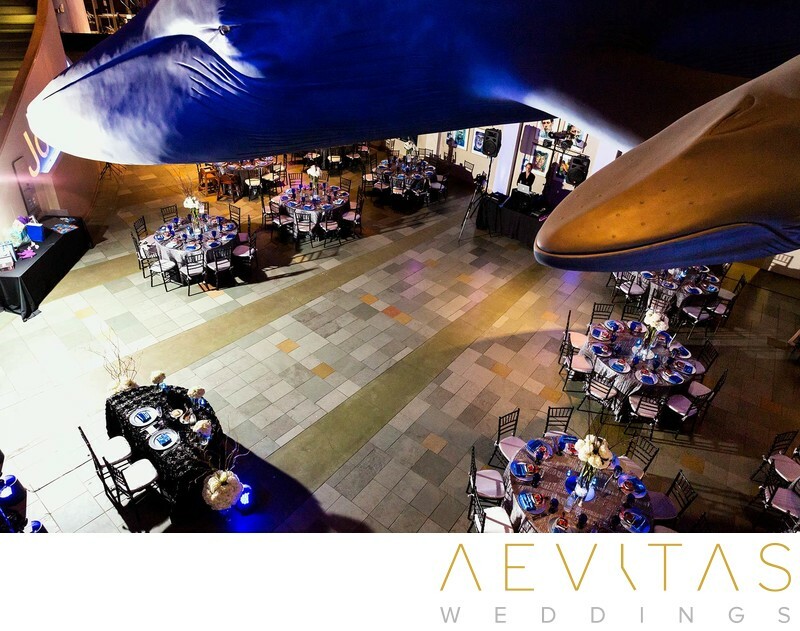 Then join your guests in the Great Hall beneath a life-size blue whale sculpture for a lavish reception celebration. With stunning interior decorations and sophisticated features, your perception of an aquarium will be transformed as you dance the night away, surrounded by aquatic life. The Aquarium Of The Pacific has a team of wedding professionals who will create an unforgettable wedding day experience in this magical environment. Wedding packages include all furnishings and tableware, as well as catering by Savor, with either a la carte or buffet dinner service available. All beverages and service are also supplied, ensuring stress-free event planning and a smooth wedding day. Whether you are an ocean-lover or just want to do something completely different for your wedding day celebrations, the Aquarium Of The Pacific is a bold and spectacular setting that will make for unforgettable wedding photos.